The Summer Sale: Going International! 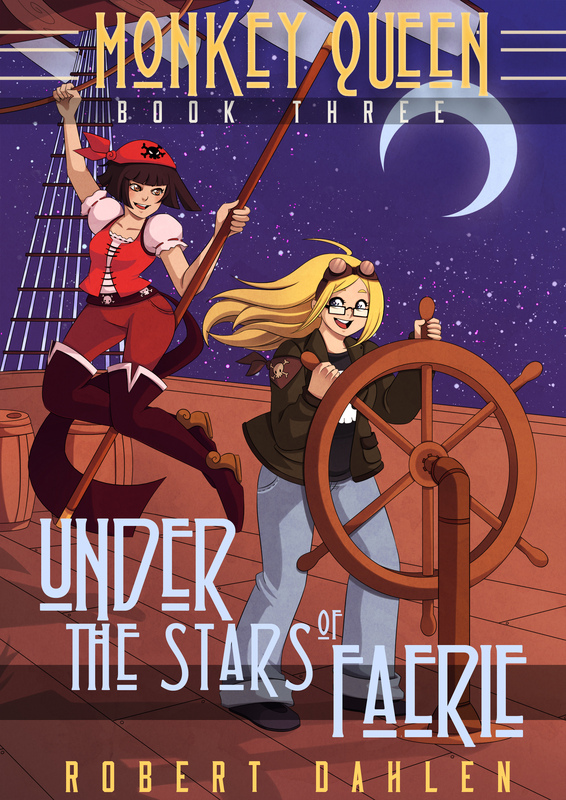 The Summer Sale: Get Under The Stars Of Faerie for 99 cents US! Beth could see the terminal, the other airships, the gloriously clear sky above, and Dawnhome below her, and she tried to take it all in, remember it all. She noticed the young pixie from the elevator was near her, sitting on her father’s shoulders, beaming with joy. Then, she looked at Michiko, standing next to her, and saw that her friend’s smile mirrored the young pixie’s, and her own. “You were right!” Michiko said. “This is awesome!” Beth nodded, too happy and thrilled to speak, as Folly’s Flight climbed, banked left and headed north. The countdown is on…again! US readers can now get the third Monkey Queen book, Under The Stars Of Faerie, for 99 cents at Amazon.com! This is a Kindle Countdown deal, and it ends at 11:59 PM PST on Wednesday, July 29, so don’t wait! And look for this wonderful cover by Willow! When a love-crazed gremlin kidnaps pixie waitress Mandy, Michiko Koyama, a.k.a. the Monkey Queen, and her partner in adventure Beth McGill journey to Faerie to rescue their friend. Circumstances force them to ally with the crew of a pirate airship, led by the mysterious Captain Ash. Dangers await them in the sky, on the ground and in their hearts. And an old enemy waits for them, his trap set and ready to be sprung…and it could mean the end of the Monkey Queen. Last chance! Get The Brigadoon Boondoggle for 99 cents US! It may be the end for Michiko and Beth…and it’s the end of this sale! Today is the last day for US fans to get the second Monkey Queen book, The Brigadoon Boondoggle, for just 99 cents at Amazon.com! This sale will end at 11:59 PM PST tonight, so don’t wait! And enjoy this excerpt from Chapter Three! The skinny man with the British accent and the sandshoes stood in front of the blue police box and smiled. “It’s all yours, Beth,” he said. “Everywhere, everywhen. And all you have to do is come inside.” As he spoke, the door to the police box swung open. Shadows swept out of nowhere and engulfed the two men, ending their argument. Beth felt a moment of regret—she had been enjoying that dream quite a bit—but it faded quickly. She shivered. She knew that voice. The shadows seemed to take form as a woman walked out from them. She wore a flowing black robe, her hair was long and black, and her eyes held a cruel joy. “Beth McGill,” Muirin said. “We meet again.” She smiled. “How—” Beth started to say. It’s here! It’s here! You can now buy Awakened, the first book in Shei Darksbane and Annathesa Nikola Darksbane’s exciting new urban fantasy series, Auralight Codex! Look for this great cover! Geeky lesbian Dakota Shepherd was just a bored night security guard, working at a museum in Knoxville, Tennessee until one fateful encounter changed it all. A rogue wizard. A demonic ritual. A silver chalice. 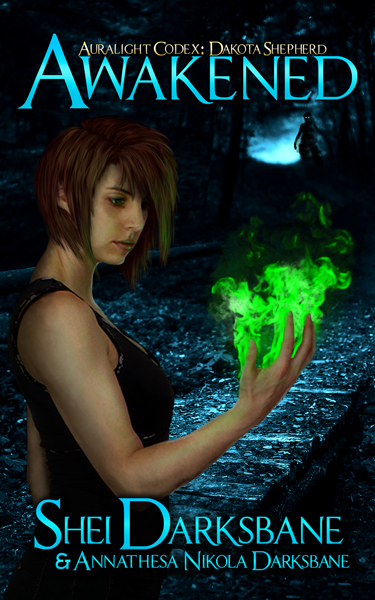 Dakota Awakened, Hellfire blazing from her hands. Dakota’s powers are a danger to herself and everyone around her, and she has to learn to control them quickly or risk losing her one chance to finally fulfill a lifelong dream. While coming to terms with her new reality, she stumbles upon a secret that changed the course of her life. Now she wants to know who is responsible for the holes in her memory, the blocks that hold back her powers, and all the years she spent alone. Who put her back to sleep when she Awakened years before? And as long as you’re at Amazon, don’t forget that you can still get the second Monkey Queen book, The Brigadoon Boondoggle, for just 99 cents! This sale will end at 11:59 PM PST on July 22. If you shop at any Amazon store other than Amazon.com, check back on July 31 for some great news! We start our Sunday catchup by reminding you that you can still get the second Monkey Queen book, The Brigadoon Boondoggle, for just 99 cents at Amazon.com! This sale will end at 11:59 PM PST on July 22. If you shop at any Amazon store other than Amazon.com, check back on July 31 for some great news! to Infinity 3.0 and beyond! Don’t forget that the Summer Sale continues! The second Monkey Queen book, The Brigadoon Boondoggle, is on sale at Amazon.com for just 99 cents! This sale will end at 11:59 PM PST on July 22. It’s for Amazon.com only, but stay tuned for a special sale for non-US fans July 31-August 2! Bad news for non-US Monkey Queen fans. As it turns out, I’m not able to offer any sale on The Brigadoon Boondoggle at Amazon stores other than Amazon.com while the Kindle Countdown deal we have right now is running. But stay tuned – I’ll set up a special sale to run at all non-US Amazon stores for the weekend of July 31-August 2 to make up for it!